This is our Homecoming Week and the kids get to dress up. Today's theme was Duck Dynasty and both of the kids dressed up. Yes I know the tutorials didnt get up this weekend. I ended up focusing on my running and did a 5k on Saturday and ran 6 miles with a group of girls Sunday - it IS coming. Tonight I am going to finish up my Project Run and Play contribution. I am in love with it. Don't think because you sew for big girls that you can't participate in the sew a longs. You SEW can! I took the Popover dress and upsized it to a 12. It is very versatile and easy to size up! Come back tomorrow for the reveal of my Oliver & S Popover Remix. It is HAWT! 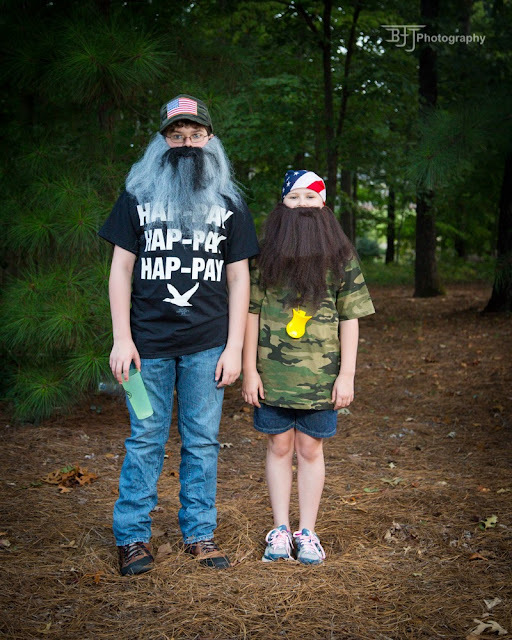 Here is our Duck Dynasty day pic!